Di questa canzone contro la guerra è assolutamente fondamentale vedere il divertentissimo video del regista KP Sasi. Il testo è in inglese con un coinvolgente ritornello in tamil. La musica è ripresa da una canzone dello Sri Lanka, Surangini. La canzone è cantata da B Jayashree mentre la ballerina è Malavika Tara Mohanan, che impersona lo spirito indomabile della satira e della resistenza. The music video will be released and screened in a program being organized by BAN (Bangaloreans Against Nuclearization) on the occasion of Hiroshima Day. The programme begins at 4 pm on August 6th at St Joseph's College, 36, Shanthinagar, Bangalore - 560 027. 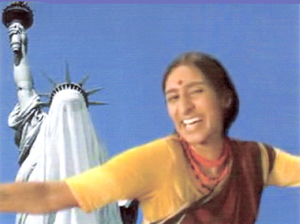 Directed by KP Sasi and based on Kamaan Singh Dhami's anti-war song “American War Paar Da! (Check Out the American War! )”, the 4-minute music video is a satirical but severe indictment of America’s role in escalating world conflict. Originally written following the post-9/11 bombing of Afghanistan by the USA, and developed to address the occupation of Iraq, the song comments on various aspects of the American empire - its stockpile of nuclear bombs, its cozy relation with fanatical and dictatorial regimes, and in fact, the very notion of American peace and liberty. The song is set to the tune of the popular Sinhalese song “Surangini” and has English lyrics and a catchy chorus in Tamil. Dancing sometimes on Bush’s shoulder, sometimes on the roof of Washington’s White House, and sometimes in a colourful parade of children protesting against war, dancer Malavika Tara Mohanan embodies the indomitable spirit of resistance and satire. In the music video, B Jayashree, Bangalore’s well-known theatre director and playback singer, has sung the song, while activist and singer, Sumathi, has been part of the conceptualization and music production. The camera work is by Sunil Kupperi and Sajan Kalathil, and Mustafa Deshamangalam worked as the assistant director. The misic video was edited by Aditya Kunigal and the song has been recorded in Music Mint.